Finnish mobile phone maker Nokia launched a bigger-screen version of its low-price Lumia smartphone on Tuesday, aiming to close the gap with market leader Samsung which sells handsets in a wide range of sizes. 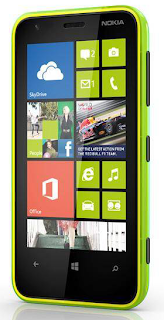 The new Lumia 625 comes with a 4.7-inch screen and will cost 220 euros before taxes and subisides. The Lumia 620, announced late last year, had a 3.8-inch screen. Nokia has recently picked up the pace of product launches. Earlier this month, it unveiled a higher-end Lumia 1020 model with a 41-megapixel camera. The Finnish mobile phone maker once produced more than a third of all mobile phones worldwide, but it has fallen behind South Korea's Samsung, which has a quarter of the market to Nokia's 15 percent. While regular mobile phones still account for the bulk of the company's shipments, smartphones are viewed as crucial for its long-term survival because of their higher margins and increasing demand for web access from mobile phones. The Finns are pinning their hopes for a comeback in the segment on Microsoft Corp's Windows Phone - an operating system that is struggling to compete with Google's popular GOOG.O Android system, used by Samsung. Tech bloggers responded enthusiastically to the Lumia 1020 launch earlier this month, saying its camera was the highest quality in the market. But analysts questioned whether it was enough to help Nokia, suffering a fall in cash reserves after years of poor sales, survive.